Italy drops 350km/h plans, VFLI orders hybrid loco, Siemens’s new speed train, DB confirms no London ICE. CAF trams for Lund and Oslo, Luxembourg line extends, Skoda metros for Warszawa. Thalys non stop Brussels Bordeaux, SNCB NOHABs return home, SNCF strike drags on. Second Whitcomb for Netherlands, Class 47 on the Semmering, DFB complete Vietnam rack loco restoration. Michael Rhodes looks at current operation at three mining networks which massive quantities of coal. Chris Bailey pops across the “border” by train into Transdniester, a “republic” which has broken away from Moldova. 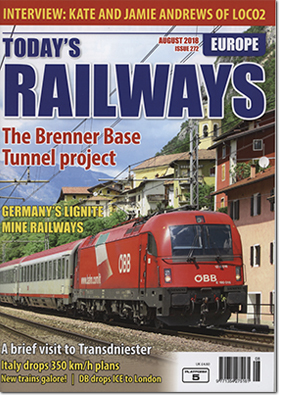 In the first of a series of articles on Alpine base tunnel, Roland Beier looks at that on the Brenner route between Austria and Italy. Alan Yearsley interviews Kate and Jamie Andrews, founders of this ticketing website.